ADATA is a leading manufacturer of high performance DRAM, NAND Flash, and storage devices. Today they launched they HD650X and HD710M USB 3.0 External Hard Drives. The HD650X targets Xbox One gamers with its bright green and black carbon fiber finish and the HD710M provides high-grade water, dust, and shock proofing, and a special edition woodland camouflage design. The HD710M meets IEC IP68 standards, meaning submersion in 150cm of water for 60 minutes and completely tight protection against dust. It meets US Army MIL-STD-810G 516.6 drop test specifications for extreme shock-resistance. 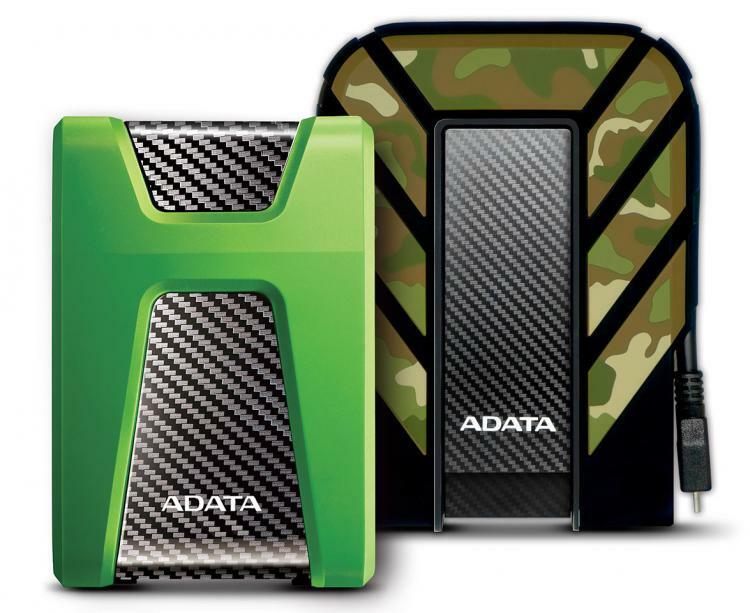 ADATA has also given the HD710M a rugged woodland camouflage. Xbox One consoles ship with 1TB drives, and gamers are needing more space with major game releases regularly totaling up to be 60GB or more per title, it adds up quick. This is where the HD650X comes in, offering up to 2TBs of storage gamers can assure they will have plenty of space to store their favorite games. USB 3.0 has transfer speed of 5Gbps, this means in many scenarios the external drive may actually prove faster for install and loading times than the internal Xbox One drive, providing a performance boost.